The trident maple is a smallish maple only growing 25 to 30 feet high. It has slightly scaly bark and new leaves come in bronze or purplish. 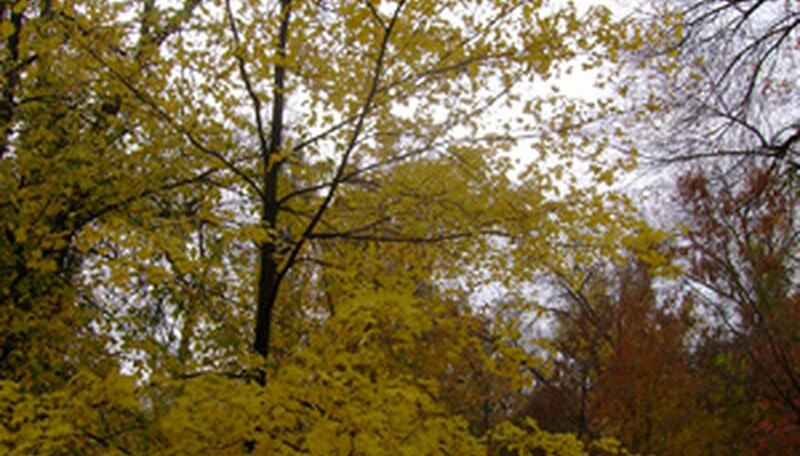 The fall colors are a spectacle of orange, red and yellow and the skeleton of the tree is comprised of many vertical stems. Maples as a whole, are not bothered by pests and disease as long as there is plenty of air circulation in the leaves and good soil conditions. The most common problem is wilt of which there are two primary kinds to watch for and anthracnose. The ideal area for a trident maple is in rich porous earth and a slightly acidic soil. Verticulum or Fusarium wilt is contracted by infected seed, debris or soil. It is a fungus and multiplies during cool moist weather. The effects are more noticeable in the warmer season when the leaves wilt and brown at the edges. Prune out the effected plant leaves and reduce nitrogen enhancement in the soil as this encourages leafy growth. If the tree is not too big a foliar fungicide such as a copper-based one can be tried. This disease is not fatal to trees but can reduce their physical appeal. It causes the leaves to fall off the tree due to a fungal disorder. Anthracnose is also call leaf shoot or twig blight and starts by browning the ends of the leaves. It is most prevalent where spring rains occur after new growth has appeared. Cankers can form on the trunk and branches and cause distorted growth. The affected growth should be cut off and disposed of. Treatment when anthracnose is already present isn't effective. Treatment with fungicides have to occur before the disease is present. Almost every plant can get powdery mildew. A mix of one cup baking soda, one tablespoon of liquid dish soap and one gallon of water sprayed on foliage can help but it needs to be done before the fungus has attacked the leaves. Those leaves already infected cannot be cured. Careful pre-season pruning to open the center and keep branches from rubbing, is an effective way to increase air circulation and keep the fungus off the leaves. This is another fungal disease (or sometimes bacterial) and control is mechanical. The leaves will get small brown or reddish brown spots on them and the edges will look like water soaked tissue paper. It is extremely contagious and can spread through infected garden tools, pests and people. All damaged material on the tree should be removed and the dead leaves on the ground need to be raked up. Pick the right maple for the area you are planting. This can reduce stress on the tree and ensure it has good growing conditions. Mulch around the tree to keep moisture in and weeds away. Fertilizing in the growth season and maintaining damp but well drained soil, will keep the tree healthy. Healthy trees are less likely to develop disease and if they do they can fight off any problems.